If you're looking to finally equip your home or workspace with a high-quality massage chair, and the price is a consideration, you will want to check out the Apex AP-Pro Ultra. Designed and manufactured by the folks at Osaki/Titan, this is a feature-rich model at a low price. The Apex Ultra debuted at a higher price originally, but the competition in the space opened the door for price drops, and the Ultra took it down, making it an affordable option for the class. You can check price on amazon here, but we suggest to read the whole review. Translation: a chair that has a lot of the same features as luxury models that won't break the bank. Not only does it come equipped with most of the features you see in a premium chair, but it also touts a few that are hard to find in others. We'll point out a few in this review and compare it to some others so you can get an idea of where the Ultra sits against the landscape. One of the first things you'll notice when you sit in the Apex for the first time is the slim, thin design. It's compact (and as there's no assembly required), yet adjustable. It's just narrow enough to let you feel as though you're being hugged, but the shoulder pads have three settings, so you can adjust the width to suit your frame accordingly. The armrests are designed as slots, so, you slide your hands and arms into them vertically. This enables the airbags to deliver an effective compression massage to your hands, arms, and biceps. Many chairs bypass the hand massage all together, and others have arm massage that is sort of weak. That isn't the case with the Apex Ultra. It delivers a deeply therapeutic hand massage like you get when you're getting a spa massage or facial. A good hand massage is a nice feature in a home chair and can be as relaxing as a head massage. I was impressed by the L-track roller on the Ultra. This track system has been around for a while, usually found on high-end models. It enables the massage rollers to give you a deep tissue massage from the base of your skull, down the back, under the buttocks, all the way to the hamstrings. L-track is one of the newest innovations in massage chair engineering, and once you try it, you'll want to purchase a chair that utilizes it. You will notice a big difference in the level of coverage. Being able to get deep into the tissue of the muscles beyond just the back area -in your glutes, neck, and hamstrings -is much more thorough for pain relief and relieving tension. This track is one of the longest you can find. It covers about fifty-one inches of body space. It is especially therapeutic if you suffer from sciatic pain. If you flip the neck and head pillow up and over the back of the chair, it intensifies the already vigorous neck massage. So, if you need a deep massage in your neck, this will fit the bill. It's hard to find a quality neck massage like this from a chair because often the rollers don't extend that high. The massage is already vigorous on its own, so this is helpful if your neck muscles are very tight or you suffer from headaches. If foot massage is important to you, you'll like the Apex Ultra foot rollers. It is isn't a common feature (most chairs only have airbag massage for the feet), so it's nice to see in this price range. Besides, it also has calf rollers, which is even rarer and a truly a great feature. 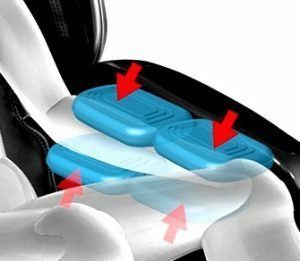 The Ultra couples the airbags with rollers, so you get a deep and effective lower leg and foot massage. If you exercise a lot, primarily run or cycle, you will appreciate this calf massage. It's serious business, though (quite rigorous), so not for the faint of heart. Price. This is a very reasonably priced chair for the features. So, it’s hard to beat in the money category. L-track. At fifty-one inches, you get full body coverage in this L-track than you can find in almost any other chair, even the luxury models. This is one of the things that makes the Ultra stand out. Arm and hand massage. Airbags deliver compression massage for both hands and arms. Slim design. This is a small chair that doesn’t take up too much space. Space-saving. You only need about an inch and half between the wall and the chair to recline entirely, so this is a preferable option for a small room, office, or apartment. Zero gravity. There are three stages of zero gravity, which is useful for decompressing the spine and taking all the weight off your joints and back. No assembly required. Tear off the package, move the chair to where you want it, plug it in, and you’re done. Remote control. While easy to use, the remote control is small, and the lights make it a bit hard to see and read in bright light. The labels wear off comfortably, and the programs aren’t labeled, so you have to scroll through the auto settings and choose the number that corresponds to the program you want. The only way to figure out the programs and corresponding numbers is to look them up in the manual. Remote storage. 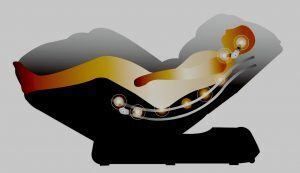 While you can slip the remote control into one of the armrest slots when you’re not using it, there’s no dedicated slot or pouch in the chair for storage during or after your massage. Calf rollers. While these work well if you like a calf massage, you can’t turn them off if you want just compression massage in your calves. Here's how the Apex Ultra stacks up to some of the other models. Both the Apex Aurora and Titan Pro Alpha are options if you're looking for a more entry-level price point. For about a third (for the Aurora) and two-thirds (for the Pro Alpha) of what you'll pay for the Apex Ultra, you get many of the same features, like the L-track and feet and calf massage. You also get two stages of zero gravity and the full range of airbags for the compression massage that the Titan brand is known for. If you're tall, you'll enjoy the extendable ottoman on the Aurora for a chair that is a better fit than most standard-sized models. If you'd like to spend even less, for a chair in the budget category, it's hard to beat the Apex iCozy. For less than you'd pay for a regular massage recliner, you get compression airbag massage, an L-track roller system, Bluetooth, and built-in speakers. If you can do without a foot and calf massage, check this one out. The Apex Harmony goes the other way and takes the features and benefits up to a notch. This chair, which comes in at about the mid-range price, like the Pro Ultra, packs a host of features for the price tag. It's got the big guns like l-track, advanced body scanning, Bluetooth, and zero gravity positioning, and you also get calf kneading. And if space is an issue, you'll want to take a look at the Harmony. This is an excellent option for small areas. For those who have a few more bucks to spend and want top-of-the-line features and technology, the Apex AP Pro Lotus ranks close to the top of the list. Perhaps the most outstanding benefit is the use of harmful oxygen ionization. This chair pumps out purified area from the shoulder pads, which are located near and pointing towards your face. This technology is used widely in Japan in all sorts of personal therapeutic products. The 3D rollers are also very effective for grabbing tight shoulder and neck muscles that are hard to reach. If you're looking for a well priced chair with almost all the features and benefits you'll find in a luxury model, you the Apex Ultra is worth considering. Its slim design is also beautiful if you're looking for something a little lower profile and less bulky than traditional chairs.